A great man died yesterday. His work improved the lives of generations of Americans in ways they could never imagine. His fearlessness motivated others. His actions made this country better. He was a revolutionary thinker whose ideas were ahead of their time. I’m not talking about Steve Jobs, the Apple founder and technology genius who lost his battle with cancer at age 56. I’m talking about the Rev. 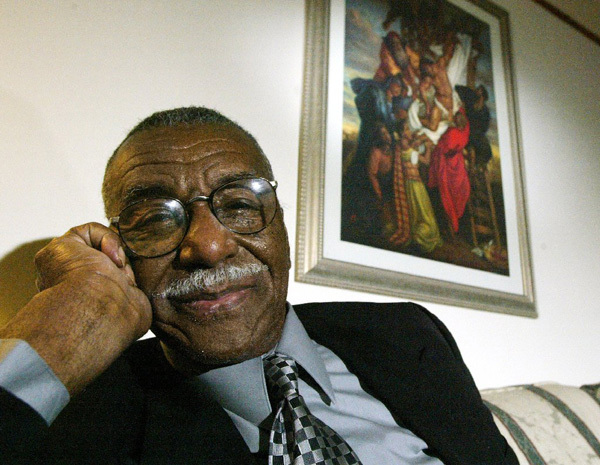 Fred Shuttlesworth the civil-rights icon who worked alongside the Rev. 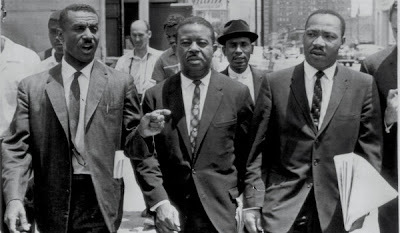 Martin Luther King Jr.Shuttlesworth died in Birmingham, Ala. He was 89. Shuttlesworth’s courage to fight state-sanctioned racial terrorism and his willingness to challenge a system that brutally annihilated those who dared to confront it deserves some attention too. This is not an attempt to diminish Jobs’ brilliance and contributions. There is no doubt he ushered America, and the world, into a new era of technological sophistication. But civil-rights heroes such Shuttlesworth merit our gratitude and at the very least some of our attention because so many of them are dying. Shuttlesworth’s death particularly resonates with me because I had the honor of interviewing Shuttlesworth in his home in Cincinnati in 2005. I travel streets bearing the name of Rev. Martin Luther King Jr. in Columbus, Cleveland and Cincinnati, Ohio with my former colleague photographer Lisa Miller for a story we were working on for the King holiday. I called Mr. Shuttlesworth, told him about my story and requested an interview. He consented. He was a sweet, polite and humble host. I was in awe. I could not believe this man I read about, whose picture I’d seen in books was just very nice. We stayed in his home for more than two hours, well beyond the interview. He spoke off topic and went on tangents about his experiences in Southern jails, at brutal demonstrations and strategic meetings. I waded in his words, soaked up his stories and marinated in his wisdom. My story didn’t turn out the way I wanted. A lot of Mr. Shuttlesworth comments were edited out of the final piece. But that afternoon with Mr. Shuttlesworth in his home remains with me. He told me he fought so hard for me, a black woman, to be able to pursue a career as a journalist and for my white colleague and I to be able to work and travel together without risk. I was hurt when I woke up this morning and flipped between national and cable news channels and see extensive coverage of Jobs’ death and not a single story about Fred Shuttlesworth’s death. Maybe I just missed the Shuttlesworth stories. I hope that’s the case. I doubt it though. Because of Jobs I have a MacBook laptop computer, iPod Touch and iPhone. But I have freedom and opportunities because of Fred Shuttlesworth. Jobs helped make my life easier. Shuttlesworth helped make my life have possibilities. Both men leave a significant mark on America and the world. I just wish Fred Shuttlesworth would get some more attention for what he did for this country.